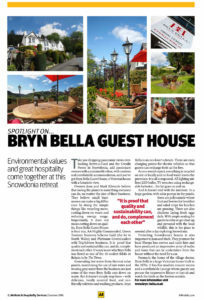 Some time ago the AA approached us for an article in their trade magazine Intouch about our Environmental Values and how it impacted on the level of Hospitality we deliver here at Bryn Bella. Imagine our surprise when it arrived in the morning post, full spread highlighting all that is good and great about Bryn Bella. With the accent on sustainability they found our approach to the business quite unique and interesting as you can see from the article below. In 2012 we became the first guest house in Snowdonia to install electric car charging points as part of Zero Net – the UK’s only unrestricted national electric car charging network. 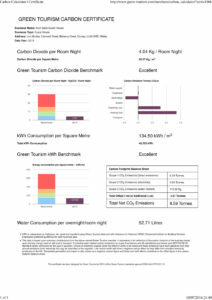 In addition we are happy to announce that we have now been awarded the Green Key International Environmental Award as of July 2016 and that our carbon foot print certificate now rates us excellent in all categories, something we are very proud about indeed. For those travelling by public transport, check out Traveline Journey Planner to see how easy it can be to travel to Bryn Bella. Collection can be arranged from Betws-y-Coed train station with prior notification. We also have a guide to seeing Snowdonia Without a Car for once you are here. Our gardens support a variety of wild life, a combination of mature trees, wild areas as well as flowerbeds and shrubs making up an eco-system helping to attract insects, butterflies, birds and mammals.